A friend and mentor of mine, Rick Segel (author of the Retail Business Kit for Dummies and co-author with me of The Retail Sales Bible) and I were discussing the disconnect between "interior" designers and "retail" designers. I keep hearing more and more retailers who hire a fancy interior designer to redo the store and they see no increase in sales. It's an easy mistake to make. We think a designer is a designer. But we forget that retail is about selling not about looking. Your retail store can look stunning, but if it's not designed for selling, then it's not doing you any good. Just like any profession, there are specialties that the firm or person is focused on. While anyone could design a retail space; it takes a Visual Merchandiser to do it right. A visual merchandiser is someone who focuses specifically in retail. They have been trained on retail principles and focus their design on selling versus winning. Just because the word designer is in the title doesn't mean they can do retail. Remember, a retail store must be designed to sell, not look good. Winning awards for design doesn't pay the bills. Let me share some examples of this. There was a retail store that paid $47,000 to have a professional group of interior store designers completely remodel, refurbish, and reignite the sales of a very successful retail clothing business. Although the store was doing well, the storeowner felt it was time to upgrade before customers started feeling the store was looking “dated.” They went on a nationwide search to find the right company. The designer they selected unveiled their ideas. Most were received very well but there were some prime selling areas that had been removed for “aesthetic reasons”. Or as the lead designer explained it, "to open areas with accent pieces that will put customers in the mood to buy." Two months after the remodel was complete, a frantic call from the storeowner came into Rick complaining that her sales had plummeted. She said it was weird because everyone loved the new look of the store. They just buy less. She sent in pictures of before and after and it became very obvious. The designers had removed all the merchandise in the areas that got the most traffic! The owner answered, “but I could go out of business waiting for that.” That’s when we got the frantic call from the retailer asking what to do. To be fair, we got the call because Rick had recommended the firm. Our response was simple, “Go to the owner of the firm.” Yes, this company is big and does all types of design work, but we knew the owner of the design firm would want to know. But she didn’t want to get anyone in trouble over this but her sales were down by 38 percent. The owner of the firm responded. Artsy accent pieces were removed and prime selling space returned to being prime selling space; yet, the store looked fresh and new—everything that she had tried to accomplish in the beginning. I might not have written this article if it wasn’t repeated right under Rick’s nose. Rick lives in a golf community that has your typical pro shop that sells shirts, balls, bags, etc.—everything you expect in a golf shop. However, this shop was in bad repair and hired a top shelf designer to help to remodel, refurbish, and reignite the spirit of the store. Just as in the story above, this designer removed most of the prime selling space and to add insult to injury, she replaced the prime selling area with tables, chairs, and a sofa to create a “lounge area.” This new area can get quite intimidating for an outsider walking in not knowing anyone or worse for a woman being “checked out” by every guy sitting in the lounge area. The merchandise had been relegated to the back of the store, which gets hardly any traffic. This is such an easy fix and we’re sure the clubhouse’s very accomplished designer will make the adjustment. Visual Merchandiser or Interior Decorator? Too many times interior decorators think they are Visual Merchandisers. They are not. But it matters little what you or I think. In interior decorating, it’s just a matter of taste. In visual merchandising, you have to report to a higher authority — the ringing of the register. Did you increase sales or just increase aesthetic? See, that is the key to any visual merchandising pro. It is understanding that adjustments must be made to make situations work. All designers make mistakes. The weak ones will insist they are right and the great ones check for success and correct to ensure success. No doubt this situation will be corrected and sales will return to exceed the levels from before. The thing that makes it bad here is that a pro shop sells logo merchandise. That means fewer sales make less brand recognition. Those sales and prospective members are lost forever. So it can impact them even greater than just lower sales today. 1. How many years have they been doing retail design? 2. How many stores have they completed? 4. 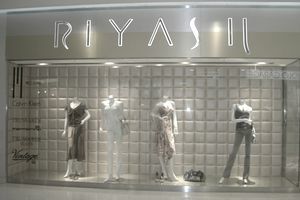 What is their philosophy in designing a retail store?